Non-EU organizations that process personal data as data controllers or processors frequently ask whether they are subject to the General Data Protection Regulation (“GDPR”). The answer depends in part on the “territorial scope” provisions in Article 3 of the GDPR. Organizations fall under the territorial scope of the GDPR when they meet one of two main criteria: the “establishment” criterion under Article 3(1) or the “targeting” criterion under Article 3(2). 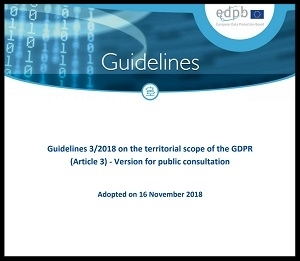 On November 16, 2018, the European Data Protection Board (“EDPB”) released “Guidelines 3/2018 on the territorial scope of the GDPR (Article 3)-Version for public consultation.” These guidelines provide interpretation and clarification of the Article 3 criteria that can help organizations understand and evaluate how the GDPR applies to their data processing. As part of determining if its activities fall under the GDPR’s territorial scope, an organization must ascertain whether personal data is processed “in the context of the activities of an establishment of a controller or processor in the Union” under Article 3(1). The EDPB notes that processing may be in the context of an establishment’s activities whether the processing takes place in the EU or not. Article 3(1) may apply to either controllers or processors having an establishment in the EU and each should be considered separately. The EDPB also clarifies that an organization located outside the EU and processing personal data outside the EU may still be subject to the GDPR through a relationship with a local establishment in the EU, even if the local establishment does not participate in any data processing. So long as the local establishment in the EU and the data processing of a data controller or processor outside the EU are “inextricably linked,” the non-EU entity may be considered established in the EU. As an example of what may be considered “inextricably linked,” the EDPB describes sales and marketing activities of a local establishment aimed at an EU market tied to data processing by a related establishment outside the EU. The EDPB also clarifies that if a related establishment in the EU processes personal data of any data subject, regardless of the location or nationality of the data subject, the processing will be subject to the GDPR. If a non-EU organization that is not itself an “establishment” (or “targeting” EU data subjects under Article 3(2) as summarized below) employs processors established in the EU, that organization does not subject itself to the territorial scope of the GDPR by merely hiring a vendor with an establishment in the EU. According to the EDPB, that EU-established processor will be within the GDPR’s territorial scope under Article 3(1) with respect to its activities as a processor. Thus, the non-EU organization hiring the vendor must consider the vendor’s obligations as a processor to comply with the GDPR requirements applicable to processors, including certain Article 28 contract requirements, and whether those obligations align with its business objectives. While an EU-established processor is required to act under a contract that meets the requirements of Article 28, the processor need not agree to assist with the controller’s GDPR obligations where no such GDPR obligations exist for the controller. A non-EU-established controller should also consider that an EU-established processor must abide by applicable GDPR provisions when processing personal data of any data subject regardless of where the data subjects reside or are located. For example, if a U.S. controller hires an EU-established processor to process data of U.S. data subjects, the EU-established processor will be required to comply with the GDPR with respect to that processing. The territorial scope provisions of Article 3(2) are more narrowly scoped than in Article 3(1). Article 3(1) applies to personal data processing relating to any natural person regardless of their nationality or place of residence if the organization meets the establishment criteria. The scope of Article 3(2) is limited to “data subjects in the Union.” The EDPB explains that determining whether an individual is a “data subject in the Union” “must be assessed at the moment when the relevant trigger activity takes place, i.e. at the moment of offering goods or services or the moment when the behavior is being monitored…” As an example, if an organization not established in the EU offers a good or service that collects the approximate or precise location of individuals in order to target services to data subjects located in the EU, the organization would be subject to the GDPR. mentions international customers domiciled in the EU, such as reviews or endorsements written by such customers. The EDPB notes that some of these factors by themselves, such as using an EU language on a website, may not constitute targeting, but in combination with others could lead to a conclusion of targeting. The EDPB also clarifies that human resources management does not constitute an offer of goods or services under Article 3(2)(a) (although the presence of EU employees could be an establishment under Article 3(1)). If the non-EU organization is neither established in the EU, under Article 3(1), nor offering goods or services directed to data subjects in the Union under Article 3(2)(a), it may still be subject to the GDPR under Article 3(2)(b) if its processing activities are related to the monitoring of a data subject’s behavior. The EDPB explains that to trigger the GDPR, “the behavior monitored must first relate to a data subject in the Union” and the “monitored behaviour must take place within the territory of the Union. For example, if a non-EU controller develops an application or service that monitors the movements of data subjects in the EU to improve traffic patterns in a certain area, the non-EU controller is subject to the GDPR. Non-EU organizations must consider a number of factors to determine whether they are subject to the GDPR’s territorial scope. They must consider whether they have met the criterion through an “establishment” in the EU or by offering goods or services or monitoring behavior of data subjects in the EU. Non-EU organizations, especially those that wish to avoid application of the GDPR, will benefit from analyzing how, where, and for what purpose they collect, use, transfer, and store personal data as well as how they have set up the location and data processing related activities of their establishments and related entities in light of the EDPB guidance. For example, a company that conducts online tracking through third parties might consider whether those third parties use data for profiling and whether they implement geo-blocking of EU territories. This analysis can help an organization understand their obligations under the GDPR and be the basis for strategies around processing and activity changes that could help minimize the territorial scope of the GDPR to certain data processing. The EDPB is accepting comments on these Guidelines through 18 January 2019. Under Article 3(3) the GDPR may also apply where Member State law applies by virtue of public international law.